This section is used to map SAP Business One fields to SPS Qualifiers (definition fields and parameter values not standard to SAP Business One, but which are required in outgoing EDI documents). This configuration screen can be opened in SAP Business One: SPS Integration > SPS Integration Setup > Integration Configuration. 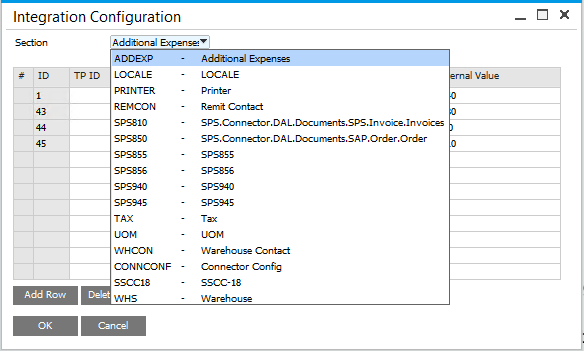 SPS 810 - Used to configure mapping for fields specific to the 810 (Invoice) document. SPS 850 - Used to configure mapping for fields specific to the 850 (Purchase Order) document. SPS 855 - Used to configure mapping for fields specific to the 855 (Acknowledgement) document. SPS 856 - Used to configure mapping for fields specific to the 856 (ASN) document. SPS 940 - Used to configure mapping for fields specific to the 940 (Warehouse Shipping Order) document. Select the section from the drop-down to begin configuration.